Motherhood is certainly the most beautiful phase of a woman’s life! Giving birth to a new life is a joy that only a mother knows. A woman’s journey as a mother is like a roller coaster ride of mixed emotions like anxiety, joy, nervousness, excitement and stress! Moreover, motherhood not only brings along joy and responsibility but also side effects like post-pregnancy weight and postpartum depression! Dealing with them needs sheer hard work and patience. 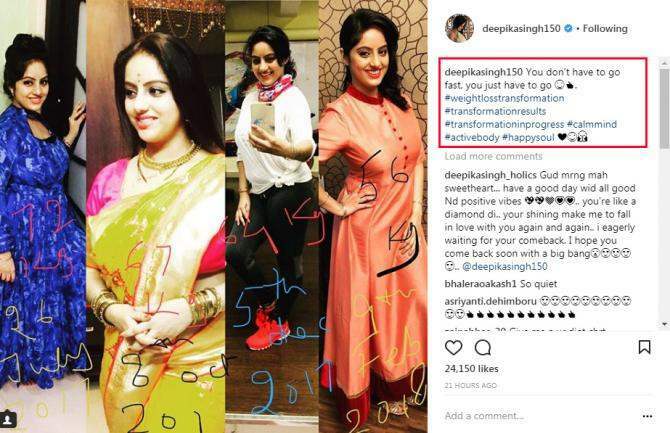 And much-loved famous television actress Deepika Singh, who recently embraced motherhood, dealt with both the issues like a boss and lost 16 Kgs. The actress had understandably gained weight and was experiencing low energy levels after giving birth to her baby boy. We are sure this will encourage new mommies! Isn’t it truly commendable how she brought down her extra kilos from 72 to 67, going further down to 64 and then finally 56 kgs? Deepika’s journey of overcoming postpartum depression and fighting weight gain is a great lesson for all newbie mommies! After all, it is important to shoo away all the negative feelings that refrain you from enjoying motherhood. No more cute, Disha Patani looks HOT AF in latest bikini pictures! PICS INSIDE!